Okay, now I know that I’m getting older, because a good friend of mine just turned 40! One of my best friends at Hanley, who is kinda like a big brother to me, just turned 40 on Wednesday. 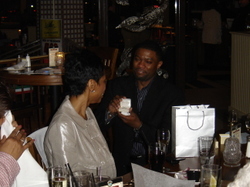 To celebrate his birthday, his girlfriend, April threw him a surprise birthday party tonight. It was an honor to be one of few invited. …and said some very nice things to April. Then he said, "Mom, I’m going to make your wish come true…" At that point he reached inside his jacket (a few of us gently screamed in that moment:) and he pulled out a white box. …and then he got down on his knee. 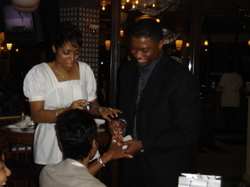 Oh my word…I had never before witnessed a marriage proposal…it was SO BEAUTIFUL!!! I’m completely beside myself, and so giddy! Anyone that knows me well, knows that I love LOVE. Blessed by Jesus, it’s so fantastic! In God’s timing I’ll have the opportunity to experience that…perfect timing, of course. In the meanwhile, this seemingly long while, I will enjoy the joy of others whenever I get the chance to! So, yay! Tony and April, I am so, so excited for you!!! !